A rectangular folding table was placed against a wall. I sat at the head, and directly to my left was a male translator, along with a female patient. Usually, I prefer to have the patient closer to me, but she looked upset as soon as she had walked into the clinic and I wanted her to feel comfortable. She rifled through her purse as I asked for the documents that listed her country of birth, age, registration number, and prior clinic notes. The clinic was really just a trailer with 3 rooms, and yet, it served a population of 6000 refugees that lived in the camp. She had waited in line at 7am to receive a ticketed number, and now returned in the afternoon when her name was called up. After waiting for me to finish reading her papers, she began to tell her story, through the translator. While she spoke, he kept staring straight ahead at the wall, perhaps attempting to give her some semblance of privacy as she detailed the sexual abuse she had encountered. At one point, her tears began to suffocate her, and while she paused to catch a breath the translator could not take it any longer. Looking right at me, with his fists clenched on the table, he said, “You see in my country, they treat us as slaves.” I nodded my head, showing him that I understood. He turned towards her, and I rapidly asked him to repeat words I hoped would comfort her. Once her tears were wiped and she looked at me, ready to go on, I prompted him to ask her the usual questions: Did she have thoughts to hurt herself? To hurt others? Was she sleeping? Was she eating? I couldn’t send her to the psychological support services provided to the refugees. The group was overwhelmed by the number of consults they were receiving, and had limited the new patients they would take to those whose abuse was within the last 6 months. So I looked in the cupboard where the medications were kept to see what was available to help with her depression. There were about six shelves in the cupboard with categories like “Antibiotics”, “Cardiac”, “Diabetes”, “Pain”, and 3-4 bottles of donated medications for each condition. I counted out the pills and placed them in one of those little plastic cups nurses hand you to take medication. I gave her enough for one week, ensuring she returned to discuss how she felt, but more importantly making sure I didn’t give her too many should she choose to overdose. They left. But I kept thinking about what the translator had said. “You see in my country, they treat us as slaves.” Surely he was being metaphorical. It was 2017 at that time, surely there was no slavery anymore? I did what I do anytime I don’t know something: I looked up Mauritania on Wikipedia. I learned that the translator had meant what he said. Although Mauritania was the last country to legally abolish slavery in 2007, a percentage of it’s population is enslaved to this day. I had looked them both in the eyes and nodded that I understood, that I got what they were going through, when in reality, I had no clue. September in Greece is humid, but on one particular day, the sweltering heat outside was unbearable. Residents of the camp, accompanied by our crowd control volunteer, rushed in an unconscious woman. Quickly laying her down on the bed, I loosened her hijab while Hassan took her vitals. She came to quickly, but immediately began shaking with fright. After conversing with her, the Arabic translator let us know the woman had not been eating or drinking for days. A few minutes passed as she sipped on water, then her story started tumbling out while she tried not to bawl again. Her family had made the difficult decision to pay for passage for her to leave Syria with her toddler son, leaving her husband and young daughter behind. Since she had arrived at the camp, she had not slept, or stopped crying. She kept wondering if they had made the right decision. Would they have been better off back in their war torn country instead, as long as they were all together? I sat there, unable to answer, handing her tissues. Words had left me. Hassan went to the cupboard and rummaged around until he found children’s vitamins. As he placed them in those pill cups, he explained that they were for her son, to keep him strong. She immediately began asking how many to give him, could she break them apart if he couldn’t swallow them, when they ran out was it okay if she come back for more? She took those vitamins with so much gratitude, I was embarrassed of how little we could offer her. The love and care for their children was insurmountable; I had never seen, nor expected to see it to such a degree. A woman once almost broke down the clinic door demanding her child be seen right away. She had already lost a son in Syria, and she would be damned if she lost her daughter too. A father came in with his sick baby, able to tell me the exact number of times her diaper was changed overnight, all the while tenderly kissing his baby’s forehead willing her to heal. Children who came to my knee would run with us as we walked through the camp, gleefully yelling, “Hello, hi!” These same kids would climb into plastic crates and pull each other down the concrete hill in the middle of the camp, completely carefree and unaware of their dismal surroundings. The joy these kids retained, and the hope for the next generation was palpable throughout the camp, regardless of what they had gone through. I am not a journalist, nor am I policy maker. I don’t know who is responsible, I don’t know how this happened, I don’t know why it continues to happen throughout history, and I don’t know where to point fingers. There is so much fear and anger that has, unfortunately, been misplaced upon refugees who are escaping war and genocide. The plight of innocent people who have already gone through so much suffering, but continue to be victims is exasperating. I don’t believe there is anyone who could meet these refugees, hear their stories, and not be moved. I don’t know what the solution is, and sometimes I am bogged down by the hurt we are causing each other. But a quote from Mr. Rogers has always stuck with me, “When I was a boy and I would see scary things in the news, my mother would say to me, ‘Look for the helpers. You will always find people who are helping.’” On this trip, I had the privilege of meeting true humanitarians who had dedicated months and years of their lives to assist with the refugee crisis. 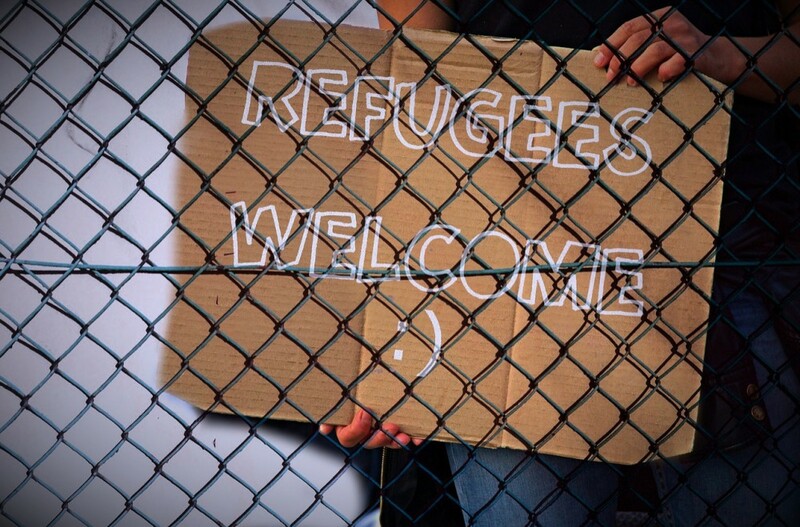 Even when their governments aren’t necessarily helping asylum seekers, they are. From Germany, Italy, Portugal, Turkey, Canada, U.A.E., and New Zealand – they showed me the world will always come together in times of need. Translators – Arabic, French, Farsi. Medics – Whether you are a medical student, physician’s assistant, doctor, nurse, or psychologist, someone there could use your expertise. If you don’t speak one of those languages, or aren’t in the medical field, there is still so much you can do to assist. There is a need for volunteers to help with crowd control at the clinics, to assist with search and rescue when the boats arrive, drivers to the camps, and to volunteer with the children there.